Mesorah Matrix [ www.MesorahMatrix.com ] is a major – and potentially landmark – intellectual-spiritual-philosophical endeavor. The plan well-underway is to publish 10 separate books – each on a very focused Jewish theme – under the Mesorah Matrix umbrella. By the end of 2013, over 130 leading authors/essayists globally will be involved in the decade-spanning project. There will be a total of 2-3 renowned independent editors, each responsible for multiple books/themes. Each book, in turn, will have 10-15 separate essays – each by a separate essayist/author. The publisher is seeking vibrant and erudite pieces for this major endeavor – from Judaism’s elite across the global spectrum. 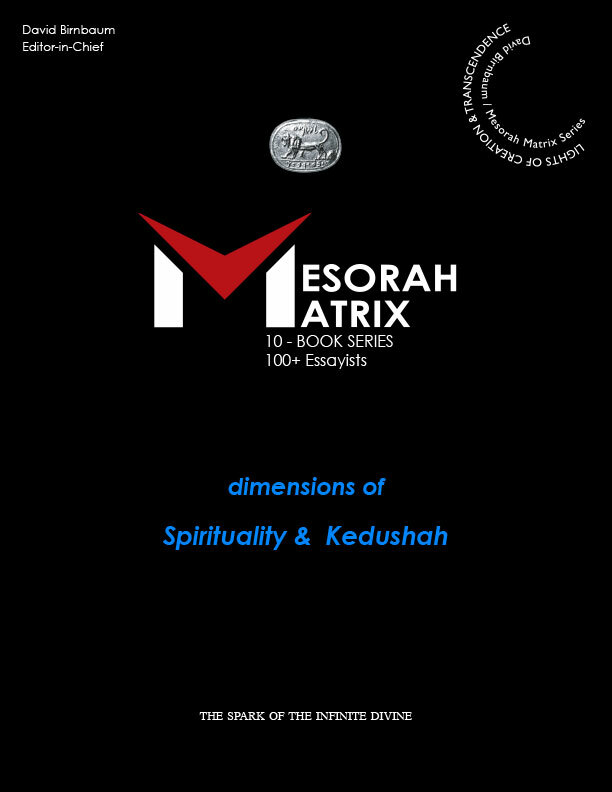 Mesorah Matrix, in turn, is under the greater umbrella of New Paradigm Matrix Publishing [ see www.NewParadigmMatrix.com ] which exclusively publishes “new paradigm” works – in metaphysics, philosophy, history and now, spirituality. Works by New Paradigm Matrix are Course Texts at major universities around-the-world. Summa Metaphysica was the focus of a 4-day international academic conference in April 2012 on the intersection between Science & Religion [ see www.Conference1000.com ]. 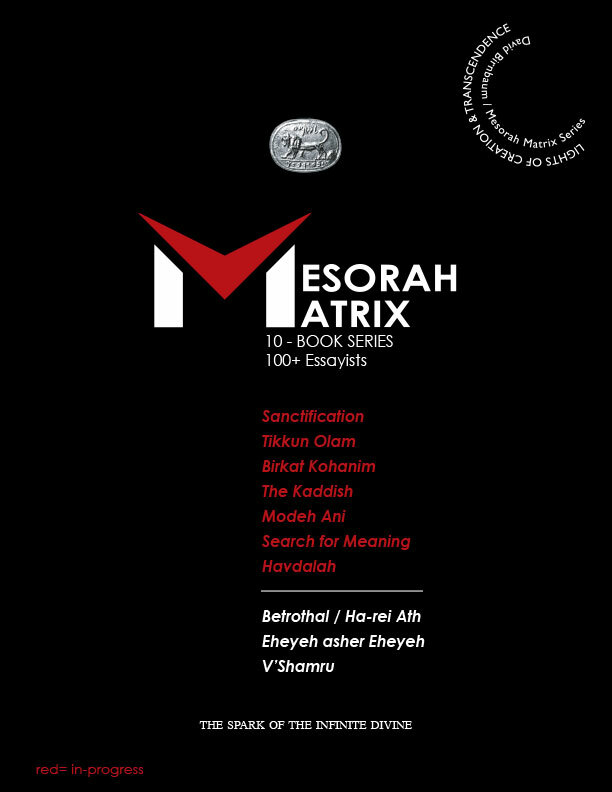 The first book of the anticipated 10-volume Mesorah Matrix series will be “Sanctification.” In turn, the first essay submitted-in was by (Chief) Rabbi Jonathan Sacks of England June 2013. Publication of Volume I is anticipated by mid-2014. Open Sourcing: Of the essays in the series, about 80% [referring to the 100+ authors noted above] will be “By Invitation.” The plan is for the remaining 20% spots to be filled – “Open Sourcing.” Meaning, members of academia, the rabbinate or the lay public are welcome to submit focused essays directly to the publisher for preliminary review [ email David.Birnbaum.NY@gmail.com ] – and potential forwarding to individual editors. Essays should be written “eye-level” for a random NY Jewish college sophomore. Acceptance via “Open Sourcing” is not a high probability. However, essays submitted to “Open Sourcing,” but not accepted, may be eligible for publication in a separate “Judaism & Transcendence” eBook(s) anthology. Poetry, neo-Poetry and Art Work are fully acceptable formats for either series. Reporting to – and collaborating with – the Editor-in-Chief are the two highly-distinguished and quite-illustrious Senior Editors – Benjamin Blech, Manhattan, a graduate of Yeshiva University, and Martin S. Cohen, Roslyn, NY, a graduate of JTS. The renowned Saul J Berman is the Associate Editor of the series. of an iterative universe inexorably seeking-after its maximum potential. For David Birnbaum philosophy, metaphysics, see also www.TToE1000.com.